Never worry about the health of your beard again with a monthly subscription to Beardpoo. You will get sent a bottle of each every month for £15 that’s a saving of £10 and one first class beard. Your beard is the first thing people notice when they meet you. Take care of it. 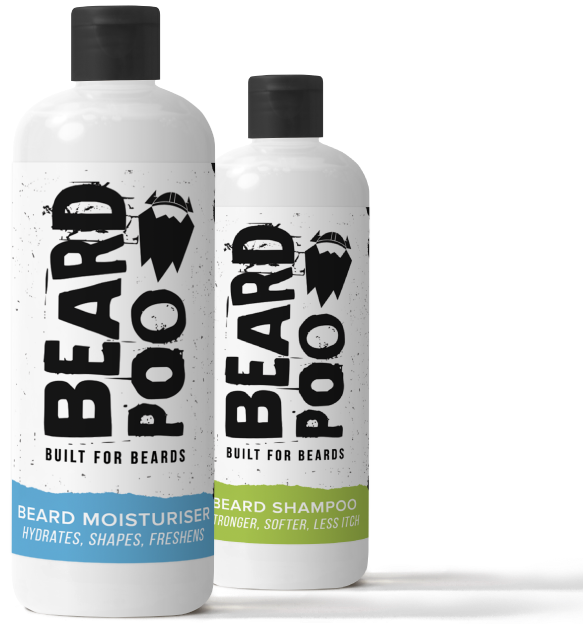 Beardpoo Beard Shampoo is the purpose built cleaning and cleansing product for men who want to grow great beards. Enriched with natural ingredients it aides beard thickness, softens bristles and soothes itchiness. Without any nasties and completely sulphate free, this unique formula is suitable for all facial hair types and is specially PH-balanced to be gentle on the face. Make your facial hair softer with our specialised beard moisturiser. It not only soothes dry skin that often brews underneath beards but is enriched with natural ingredients that tackle beardruff. It is a light texture, which makes it easy to spread through facial hair and skin, and helps to keep wayward bristles in check leaving you free to style your beard the way you want. Sulphate and free of harsh chemicals this moisturiser will give you the barbershop experience in the comfort of your own home.